Above: James Bond realises that Kristatos is a double agent - and the real target he should be eliminating. Bond is sent to Rome to investigate drugs smuggling, and his contact Kristatos tells 007 of Enrico Colombo. Bond gets close to Colombo’s mistress by posing as a researching author, but then is captured by Colombo, who explains to Bond that Kristatos is the actual villain and is smuggling drugs for the Soviet Union to undermine the West. Bond and Colombo raid Kristatos’s warehouse, and Bond kills Kristatos in the process. Above: The opening panel of "Risico"
Above: The dockyard battle scenes are thrillingly depicted by John McLusky. 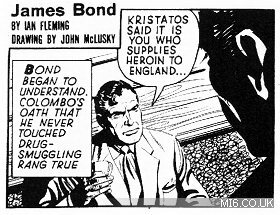 Risico, the fourth of five short stories in Ian Fleming's "For Your Eyes Only" collection (but the first to be translated to comic strip form), is adapted faithfully by writer Henry Gammidge. The short story format proves perfect for the syndicated newspaper run, with relatively brief runs (only twelve weeks), and no real need to cut swathes of Fleming prose from the adventure. 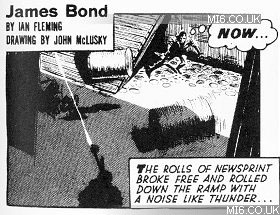 John McLusky shows better consistency and improvement of his action scenes compared to the previous strip Goldfinger, and a lot of the graphical elements used in Risico would remain common devices of future strips. With Risico, McLusky and Gammidge produced a down-to-earth James Bond adventure, and would continue in this vein with the next two installments: From A View To A Kill and For Your Eyes Only. Colombo: "At what range was that Albanian last week?" Henchman: "Twenty yards, padrone. The harpoon went right through him..."
Colombo: "And HE was a fat man - perhaps twice as thick as this one!" The battle between the smugglers in Santa Maria is almost a storyboard sequence for the action in "For Your Eyes Only" - a film made exactly 20 years after the comic strip. Risico formed the basis of the 1981 Roger Moore movie. Titles Included: "Goldfinger", "Risico", "From A View To A Kill", "For Your Eyes Only", "Thunderball"
Images courtesy Titan Books and Amazon Associates.